Sept 20, 2009 -Van Snyder's MAT expansion and apparently running code below. Back around 1969, my brother, David Ring, was a computer lab assistant at the University of Illinois in Urbana. They had a room-sized computer called the Illiac II. The university had an engineering open house, and my brother invited me to town, and that night took me to a room full of teletypes, logged me on, and showed me how I could play 3-dimensional tic tac toe. I played a few games, and got beat every time. 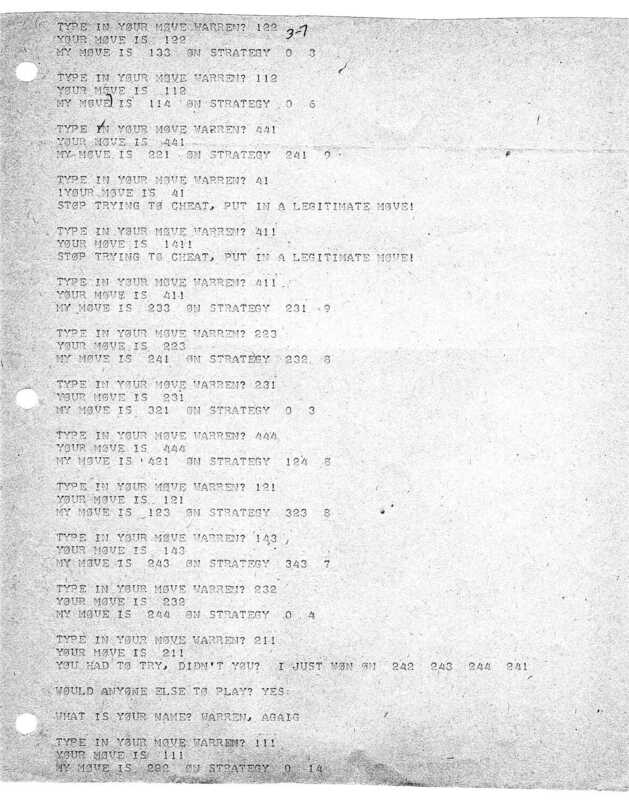 When he walked away, being the nerd that I was, I turned on the paper tape punch, typed “LIST”, and out came the source code in BASIC, which I took home. Years later, I converted it to Turbo C under Windows 98, and studied how it worked. 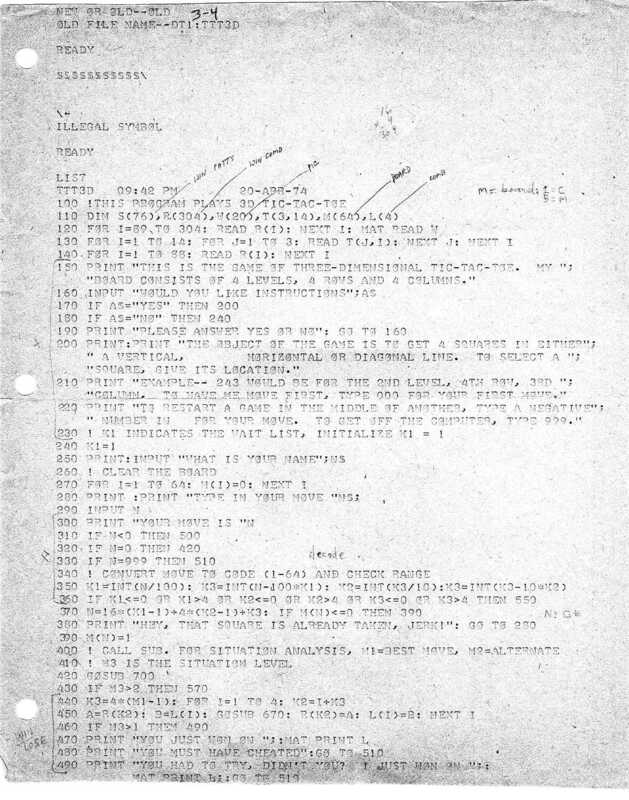 It appears to have been originally written in assembler on a computer called the “TX0”. Attached are the files containing the source code for 3D tic-tac-toe, 4 in a row (which the 1401 could play as a demo game) in BASIC. It’s only 3 pages of source code. 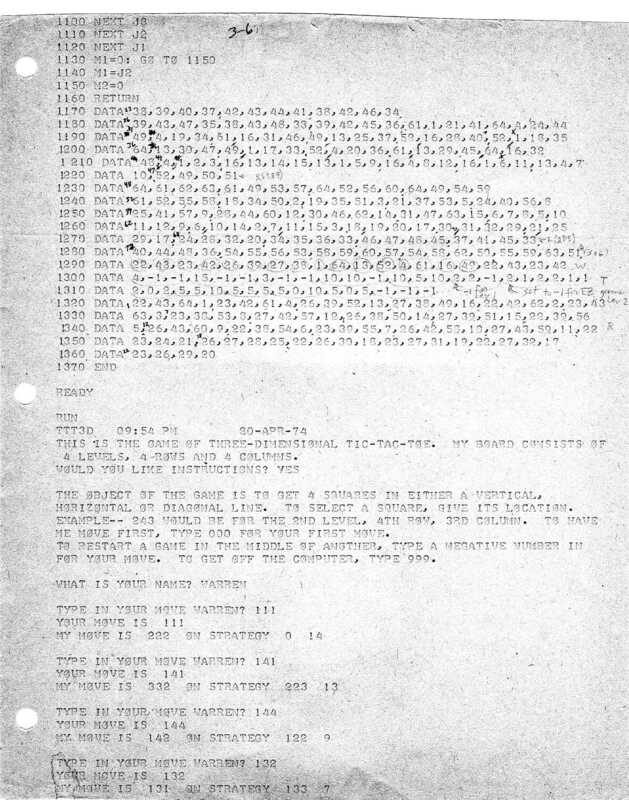 This is teletype output (I have the original), and I wrote on it with a pen when I was analyzing the program. The bottom of the listing (on page 5) shows that this game was played on a DEC system running RSTS (on an 11/70, as I recall) at Taylor University (my alma mater) on April 20th, 1974. This is because I had saved the paper tape from U of I, and loaded it onto the DEC system (I graduated from Taylor in 1973 with a bachelor’s, in addition to graduation from DeVry with an associate’s in Chicago in 1969) on a visit. I beat the computer. In the 5 intervening years, I had analyzed the program and found that it could be beat, but only if you manage to play four Xs in a square pattern on the board. A newcomer would never figure that out. The program contains eight nested “FOR” loops, effectively providing several levels of look-ahead. Whoever wrote this program was either a genius or was an early gamer with a lot of time on his hands, probably not a casual U of I student. If so, someone along the way translated the program from TX-0 assembler to BASIC. I never wrote in Autocoder. DeVry in Chicago taught us SPS-2 and machine code. 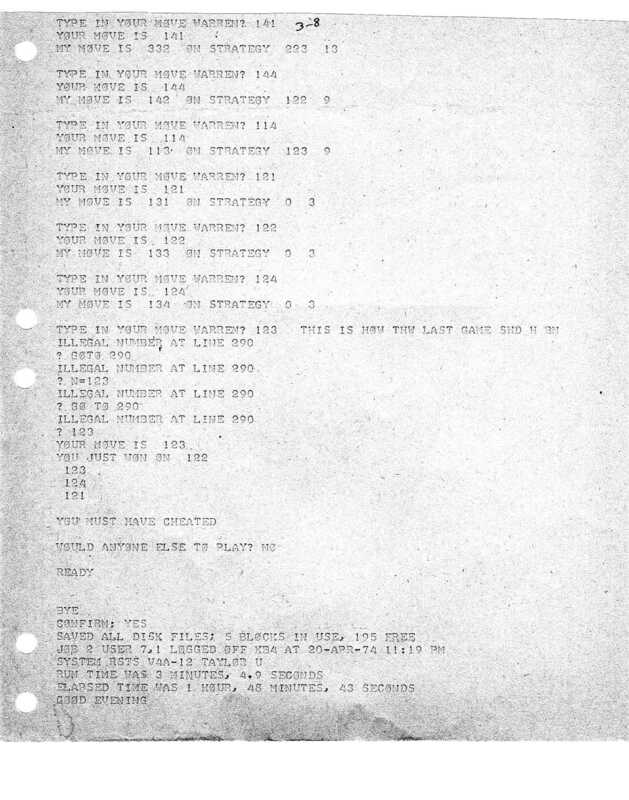 I haven’t written an SPS-2 program for 40 years, though I still remember a lot about both. I even downloaded Rope, but had no 1401 simulator, and it would have taken more time than I had. One of the arrays in the program would likely require more than 1000 characters of memory, and I’m a little fuzzy on how adding a decimal subscript to the base address of an array larger than 1000 characters would be done. BASIC has GOSUB and RETURN statements, but the 1401 doesn’t support these – it has no stack. However, I believe I saw in your journal long ago a remark attributed to Ron Williams to the effect that when the 1401 takes a branch, the address of the next instruction (effectively the return address) is left in the “A Register”. 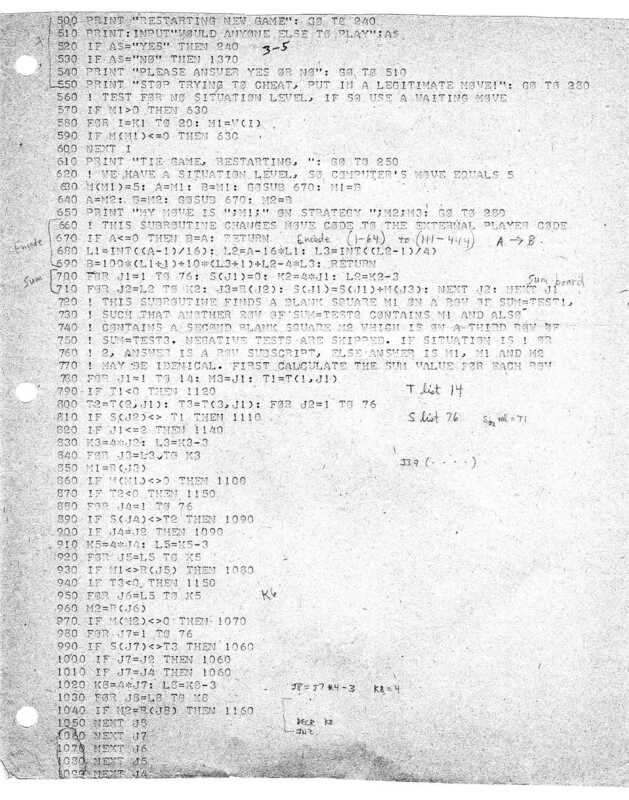 If so, you could perform a GOSUB by executing a 1401 Branch instruction from the mainline program to the subroutine, put an unconditional Branch instruction at the end of the subroutine, and having the subroutine, as its first instruction, save the contents of the A Register to the operand of that last branch instruction in the subroutine (the last three characters of the subroutine, following the machine code “B” for the branch). You could rig the program so that when the player decides on a move, he enters it via the sense switches (B through G). B and C would be the level, D and E would be the row, and F and G would be the column. So, for example, B and C down would be level 1, only C up would be level 2, only B up would be level 3, and both up would be level 4. If the user makes a mistake and wants to back up, he turns on the A switch (with the 1402 hopper empty) and the program backs out the previous move. On each move, the printer could print a list of all moves ( a maximum of 32) by the player and the 1401 each, then execute an “F1”, kicking the printer up to the top of the next page (printing one page per move), and execute a Halt to allow the player to enter his next move. I experimented with having the 1401 print a bunch of Xs and Os to represent the board on each move, but it looked like it couldn’t be done with a program that fit into 4000 characters of RAM. I could be wrong. 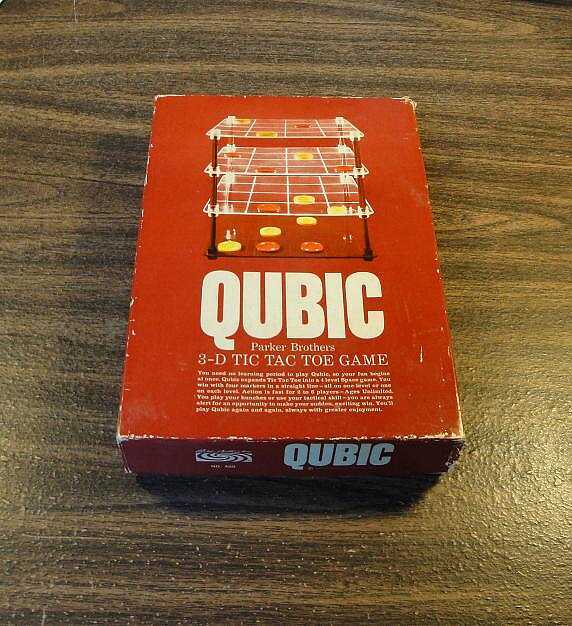 You would need to buy a Qubic board on eBay and label the squares. I suggest you remove the references to “strategy” from the game text. Anyway, you can forward this to the others and see what they think. I wish I lived in your area. I’d be a regular there. 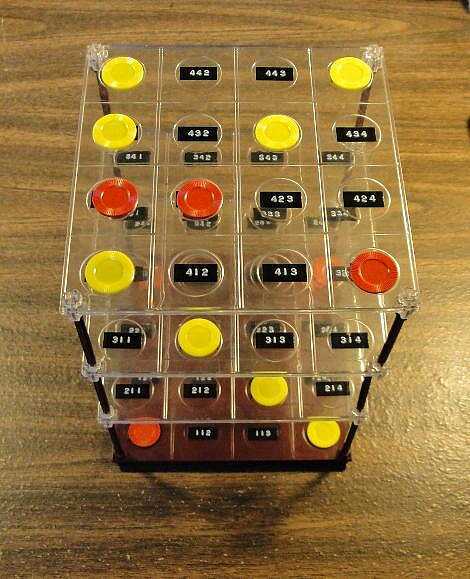 By the way, we used to play 3D tic tac toe on paper at the back of the classroom at DeVry like you did [in the Army]. Great minds think alike J. Don’t hesitate to send me correspondence. Sept 20, 2009 -Van Snyder's MAT expansion and apparently running code. There were several things it didn't like. Lines beginning without a line number. After responding to vintbas's complaints, it appears to work. Let me know if there are typos in it. 155 PRINT "BOARD CONSISTS OF 4 LEVELS, 4 ROWS AND 4 COLUMNS." 206 PRINT "SQUARE, GIVE ITS LOCATION." 215 PRINT "COLUMN. TO HAVE ME MOVE FIRST, TYPE 000 FOR YOUR FIRST MOVE." 225 PRINT " NUMBER IN   FOR YOUR MOVE. TO GET OFF THE COMPUTER, TYPE 999."